Celebrate your wedding in Venice is the guarantee to fill up your memories with beautiful pictures and your camera’s memory card with beautiful memories. No traffic, all year long magical Light, colorful reflections, romantic palaces … Venice is among the most photogenic cities in the world. With its narrow streets, canals and squares, Venice is already the perfect backdrop to organize a photo shoot in bride outfits. A common thought is that Venice is invaded by a flow of tourists, but it’s not quite true. The city has its crowed main pedestrian axes and peak hours. However it’s easy to avoid groups and make unforgettable pictures. Early in the morning, the Light is perfect and the places (even St. Mark’s Square) are deserted. Later in the morning, or in the afternoon, you can walk to less busy areas like Castello or Cannaregio. At dusk, the sky ignites with colors reflecting on canals, in a worldwide unique light show. What is a “campo” or plural “campi”? 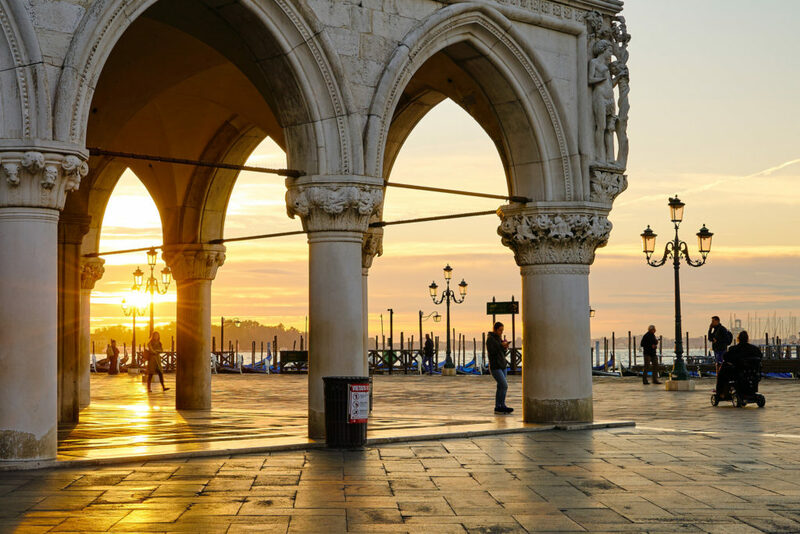 In Venice, except for Saint Mark’s Square, you will never hear of a square or Piazza. The places are called “campo” like field because at the time of the Republic Serenissima , they were used to grow fruits and vegetables! These spaces more or less wide punctuate the city and open as a parenthesis of breathing and sun in the network of alleys. One of the largest Venetian campo, with a beautiful church and its milky facade. On the square, a small canal and its gondolier, perfect to start a tour of the historic center. Early in the morning, right in the middle of the square, a fruits and vegetables stall and a small fountain liven up. In the evening, the terraces are full of people. Roses, red benches, families and children playing. Calm all morning, the campo wakes up in the afternoon, after school. A place about the size of my hand, this campo is so romantic. Around the well, you’ll see a fishbone shaped brick pavement. On one side two facades of churches, one baroque filled up with statues, close the tiny square. On the other side, a wide canal, an cleared view, lots of light. open on the lagoon, close to the pier for the islands of Burano and Murano. With its wide baroque facade and its oratory, few trees and its fountain, it’s a peaceful stop any hour of the day. Tiny and yet among the most charming, the campo San Vio directly overlooks the Canal Grande. Breathtaking view of Ponte dell’Accademia from this small jewel and its charming church, cappela San Vio. But to find your own favorite campo, the best is still to get lost in the streets of Venice… high risk of heart stroke ! Why picking up Venice to get married ?